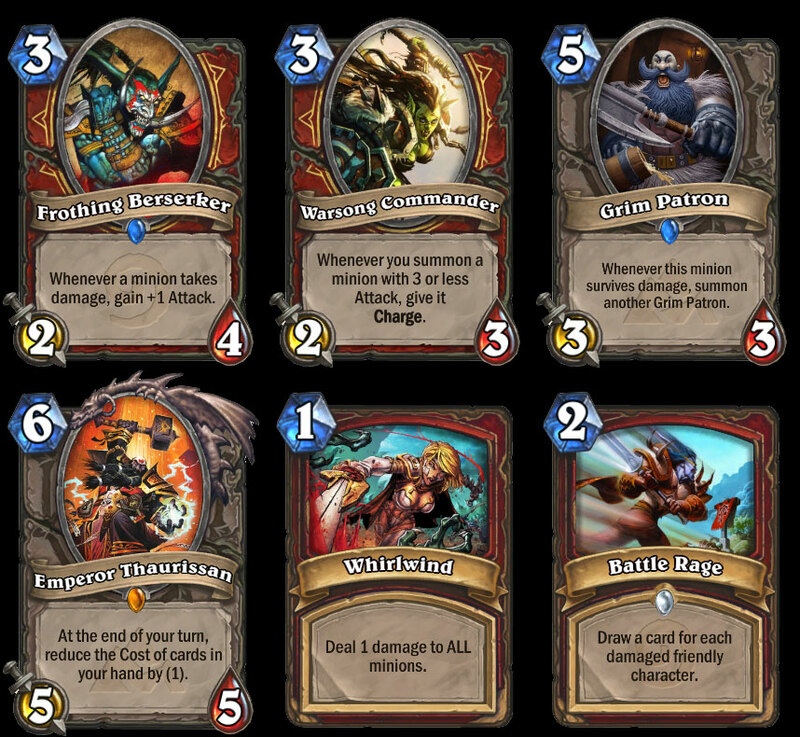 One of the most dominating decks out there in Hearthstone in the current metagame is Patron Warrior. This is a wombo-combo deck that can pull off such insane, come-from-behind wins that even Magic: the Gathering veterans of Extended would feel at home. In a game that is derided for being decided by coin flips, the deck itself doesn’t really feature any RNG beyond the standard that comes with drawing cards. Almost everything about the deck is mechanically perfect and efficient. And it needs to die. The strength of Patron Warrior are the sort of dual win conditions. The name of the deck comes from Grim Patron, there in the upper-right, and the sort of shenanigans that occur when you summon one with a Warsong Commander on the board. If you play both, you basically get a 3/X minion for every minion your opponent controls that has less than 3 attack – your first Grim Patron Charges into, say, a 2/2, summons a new 3/3 Grim Patron who gets Charge from the Warsong Commander and then attacks into another creature, etc etc etc. You do not technically need your opponent to have creatures for things to get out of control, of course, as your deck is also filled with effects like Whirlwind that end up dealing 1 damage to all creatures. One Grim Patron becomes two, two becomes four, and so on (there is a 7-creature limit thankfully). From empty board to overkill 2x. If you want a more in-depth guide from a Top-10 player, here you go. It isn’t difficult to nerf Patron Warrior. In fact, it’s incredibly easy to do so in all sorts of ways. The design trick here is to do so in such a way that either A) reduces the effectiveness of the deck without killing it entirely, or if that’s not possible or wanted, then B) killing the deck with as little collateral damage as possible. For example, Warsong Commander could be changed to read “Your other minions with 3 or less attack have Charge.” The idea being that while you can still have crazy powerful Frothing Berserkers, they would lose Charge the moment their attack got above 3. It’s not even all that intuitive that the summoned creatures retain the Charge ability granted from the Commander after their attack goes up in the first place, but that’s what happens. And in case you didn’t know, Warsong Commander has a history of enabling OTK combos, especially back in the day when it simply gave all your minions charge no matter their attack power. Hell, it was even changed again fairly recently to allow the Charge to apply to summoned minions, e.g. Grim Patrons, instead of just affecting creatures played from the hand. Is nerfing Warsong Commander the right choice though? Consider some alternatives. For example, a lot of the OTK shenanigans are only enabled from the use of Emperor Thaurissan permanently reducing card costs. Getting one trigger from Thaurissan can grant you the ability to play Warsong Commander, Grim Patron, and Frothing Berserker all on the same turn, possibly even turn 8. And if you had a Whirlwind in hand during the Thaurissan trigger? Suddenly you’re dealing with 11 Charge damage to the face. Or 21 Charge damage if you have a 2nd Whirlwind-like effect. Or even more depending on what your opponent’s board looks like. So another nerf avenue would be to tweak Thaurissan’s effect to, say, be unable to reduce card costs below 1. Or only reduce spells, or something. Or perhaps we should zero-in on the OTK culprit himself: Frothing Berserker. One way is to change the trigger to key off only friendly minions taking damage. Or only enemy minions. Or even the nuclear option of “+1 attack for each damaged minion,” with the attack bonus going up and down as minions are killed or healed to full. Some people in the Reddit thread think it’d be better to nerf the sort of card draw engine that Patron Warrior has access to. This isn’t a particularly viable avenue in my opinion, as the only real Warrior-specific draw card they could nerf is Battle Rage, which was already nerfed twice from before (it used to trigger off of all damaged minions, then all damaged characters with a cost of 3). How would you nerf it anyway? Make it a 50% chance to draw a card? It is absolutely true that Patron Warrior includes a lot of card draw to assemble its combo pieces, but a similar amount of drawing is available to most other decks. Paladin card is from the new set. 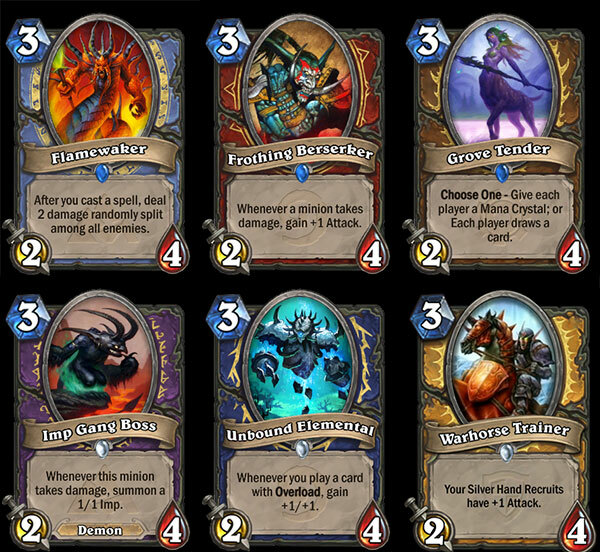 I’m not saying they’re all equally powerful or useful – Flamewaker in particular can make for some huge tempo plays – but Frothing Berserker in particular seems to scale wildly higher than the others and is more open-ended. I know that I hate, hate, hate seeing that card on turn 2 in Arena because it basically means I must kill it immediately or simply be crushed under the weight of value. So there it is. I am not entirely sure that the dev team actually are going to nerf any part of Patron Warrior, especially this close to the next expansion release (by the end of August). On the other hand, expansions are pretty much perfect times to nerf things, and we’ve seen them nerf cards at these times before. That being said… I’m not sure I want to see the metagame come The Grand Tournament if it spawns a deck that can destroy Patron Warrior without nerfs. It’s like swimming with something that consistently eats Great White Sharks. Posted on August 10, 2015, in Hearthstone and tagged Blaugust, Game Design, Nerf, Patron Warrior, Wombo Combo. Bookmark the permalink. 12 Comments. What kind of funny is you say the deck doesn’t rely on luck, yet in the screen shot both sides have a Dr. Boombot (which is a great example of a card that should be nerfed, yet hasn’t for months). That aside, I run a version of this deck, and yea, it’s dumb both in how effective the deck is and how mindless it is to play. So basically, it’s a standard HS deck. I’ve lost a lot of faith in Blizzard over the lack of a Dr Boom fix, I admit. At a minimum, the Boom Bots should have been reduced from 1-4 damage to 1-2. But in the context of this deck, the Dr Boom is irrelevant – the Top10 player deck I linked doesn’t actually have any other legendary than Thaurissan. 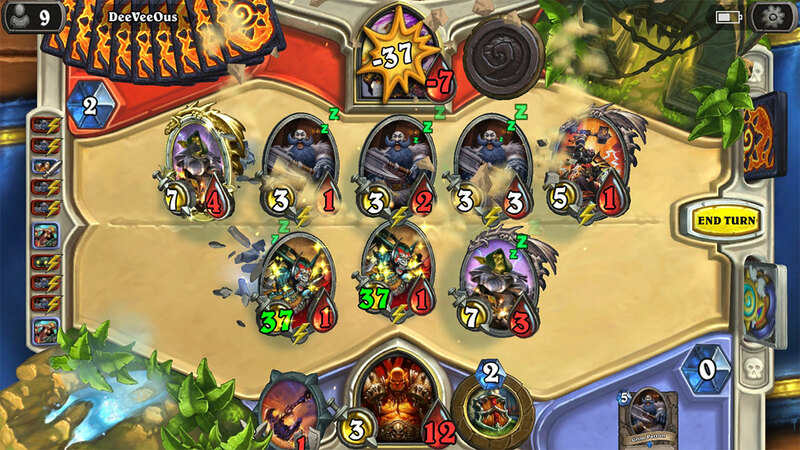 I chose that screenshot (from a different deck version) to highlight the absurdity that is two 37/1 Frothing Berserkers. Indeed, there is no randomness at all with the Top10 version. With HS being on a much faster development cycle than MtG, how much of this is simply not being able to adequately test for broken mechanics? Seems like if they’d have had enough time to test this would never have come up, either through card costs or changes to those underlying interactions. Or, do they just figure it’s only going to last for 2 months before they have a new broken mechanic that fixes another? Definitely an example of “iteration” in Blizzard culture either way. The Grim Patron does that. It shows our game has some depth, and you can do some crazy stuff, but at the same time we don’t want players to not have any defence. If there’s nothing you can do against a Grim Patron deck, and it kills you in one turn for example, that’s a problem. So we watch that stuff really closely. We always try to add a little bit of craziness to the game and let people discover it. When we put Grim Patron in we didn’t know exactly how good it was going to be. We had a good idea, because we played it a lot. We knew there was going to be some variance once people figured out what the best version was, and what the meta was going to be. I think we’re going to keep making some crazy cards in every set that are dangerous and hopefully going to work out. I’m not even saying that that is necessarily the wrong way to balance a game, but my primary concern is that Blizzard is both doing that and being extra careful in not nerfing things despite digital CCGs being the perfect medium to do so. The Magic folks have to issue nerfs and errata for paper cards all the time despite that meaning you have to bring computer print-outs to show your friends that their OP combo doesn’t technically work anymore. And it’s not even as though Hearthstone cards have value in of themselves, so nobody is technically losing money. It’s funny, it seems like if they are changing course and allowing more radical combos to exist, they’d be better off clarifying that instead of just sitting back and watching. When the Patron deck came out I lost to it a lot, so I tweaked my decks to counter it. I rarely lose to it now, because I know exactly how it works. I run mage, paladin, druid, shaman and hunter decks, and if these five out of nine classes can defeat the deck on a regular basis it would seem to me that balance is not a problem. So my opinion? There’s no need to nerf it. The meta just needs to adjust accordingly. I mean, there are a couple different ways to look at it. The first is that Grim Patron has been the top deck for the last nine weeks, full stop. That might not sound like much, but it’s technically two full “seasons.” So while you can certainly tech against it and “win on a regular basis,” that still hasn’t stopped it from being literally the best deck in the game with little deviation for long time. The second is whether, regardless of the strength or weakness of the deck, Blizzard should implicitly support (by not nerfing) a strategy/combo that deals 30+ damage from an empty board. Miracle Rogue was nerfed due to being non-interactive. The original Math Warrior (or Molten Pandas) was nerfed due to being non-interactive. The original Freeze Mage was nerfed due to being non-interactive. Hell, when I see these 37+ attack Frothings, I just laugh at how worried we all were about Leeroy shenanigans back in the day. Blizzard can certainly do nothing and let either the meta or new cards force some kind of paradigm shift as some even more powerful deck comes into existence. But the question you have to ask yourself is whether the hands-off approach is worth the cost. Because there is a cost in everyone needing to tech around a deck with OTK combos. Nine weeks is a long time, and it does say something about the deck given its popularity. But it’s not like it doesn’t have a counter – traditional aggro decks like Face Hunter, Aggro Paladin, Zoo, etc., can push the Warrior behind before it can set up the combo by inflicting early damage AND forcing the Warrior to play cards like Whirlwind, etc., as clears instead of Patron spawners. Handlock and Ramp Druid match up well against Patron too, because they field massive high strength minions with taunts, and the Druid combo of Savage Roar + Force of Nature comes online before Patron does. My Mill Druid just laughs at Patron Warrior – it’s a guaranteed win for me. BTW don’t take my word for it, my BNet tag is #Theodorius, add me and play me with the Patron Deck – I reckon I will win 8 out of 10 times with Mill, and 7 out of 10 with the rest. I also think the OTK potential is also overstated, requires quite a few things to align for it to actually occur, and is exaggerated by people who dislike the deck. I read the Reddit thread you linked, and I am firmly on the side of people who think things are fine as they are. Some good arguments are posted there for both sides. This is just my opinion as a casual HS player. I don’t follow Reddit or the meta religiously, and I have not achieved Legendary – my best rank to date is 7, so I don’t know if this qualifies me to speak on this with any authority. This conversation may also be redundant in a week or two anyway, since a new meta will begin with the release of the Grand Tournament. As I mentioned before though, I’d personally want Frothing nerfed simply because it is possible to have outrageous amounts of attack in combination with Charge given by the Warsong Commander. Priest having Divine Spirit/Inner Fire shenanigans is one thing, but 30+ Charge damage from the hand with an empty board – no matter how unlikely – is something else, IMO. I take this to mean – the pros prefer Patron, yet many times other decks are just as powerful if not more. Perhaps Patron wins more consistently (*), but it is hardly the only game in town. Finally I agree with Duke 0, if a deck becomes very popular, it becomes easy to find a deck that counters it. (*) I wonder if there is any data out there. last hearthstats report I see is for May ( http://hearthstats.net/reports/2015/may ) and Warrior there is 3rd in constructed. The voting on Hearthpwn isn’t particularly indicative of anything, as joke decks easily get hundreds of votes at any given time (i.e. Chicken Warrior sitting at +169). That said, instead of the last month, if you look at top-voted decks of all time, hey, Patron is #1. That particular build got viewed 1.2 million times, putting it at #4 behind the historical Shockadin (Undertaker nerf), MiracleMechMage, and GvG FaceHunter. Which really says a lot about a deck, IMO. You can build around Patron, sure. But that’s kind of independent from the question of whether something like Frothing (or Commander or etc) is worth keeping as-is. You could build around Miracle Rogue too, for example, or Mind Control at 8 mana, Pyroblast at 8 mana, and so on.